I'm a huge lip gloss junkie and Bloom Cosmetics has a huge line out of lip glosses, plumpers and lip sticks. Two really stood out for me out of their product line. The Cosmopolitan Bloom Lip Gloss although a little expensive at $20 a tube, is well worth the money. I have since went to Ulta and purchased 3 more tubes in this shade! Maybe it's just because i'm obsessed with pink lip colors, but this lip gloss makes your lips plumper and shiny with just enough pink. Goes great with a good tan! On a scale of 1 to 10 i give this gloss a 11! I was soo excited to go to Ulta & find out they were actually losing the Bliss line, and the whole aisle was 75 percent off! woo hoo! 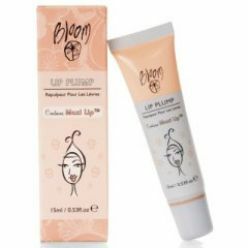 The bloom Lip plump was a little bit of a dissapointment. Every time I try a new lip plumper, I get a little too hopeful thinking maybe i found the answer to all my thin lip fears, however this one fell flat. When i put this on my lips, they just felt wet. No color, no plump and no tingle! They did moisturize my lips though, so it wasn't all bad.